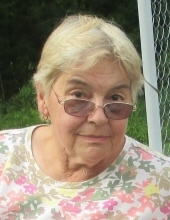 Patricia J. Palmiero, 72, of Meadville, passed away Tuesday, January 29, 2019, at Meadville Medical Center. Patricia was born in Meadville, on November 25, 1946, a daughter of the late Robert E. and Mary Jane (Grounds) Straw. On January 20, 1968 Patricia married Larry A. Palmiero. She was an active member of The Master Gardeners Program and North Meadville Church of Christ. For more than 25 years Patricia and her husband owned and operated Palmiero's Drive Inn in Fifth Ward. Additionally she worked as a bookkeeper for several area businesses including Hatzo Industrial Supply, Hayes Salvage Yard, and Meadville Wholesale Tractor. A graduate of Meadville High School, Patricia was also a graduate of Robert Morris University where she earned her Associates Degree in Office Administration. Patricia became a Master Gardener through the Penn State Extension Program and had a deep passion for gardening. What she enjoyed most in life was being a mother, grandmother and friend. She will be sadly missed. In addition to her husband, Larry, of 51 years, Patricia is survived by three children Jode Palmiero (Charity), Kevin Palmiero (Emily) both of Meadville, Amy Palmiero-Winters of Hicksville, NY, four grandchildren Rachael Palmiero, Evan Palmiero, Carson Winters, Madilynn Winters, a sister Debbie Jones (Butch), a brother Robert Straw (Jeannie) both of Meadville, a sister in law Darlene Straw of Greenville, and many nieces and nephews. In addition to her parents, Patricia was preceded in death by an infant son Keith Palmiero and a brother Douglas Straw. Family and friends are invited to call from 2-4 PM on Friday, February 1, 2019, at STEPHEN P. MIZNER FUNERAL HOME & CREMATION SERVICES, INC., 404 CHESTNUT ST., MEADVILLE, where Funeral Services will follow at 4 PM with Elder Richard Moore of North Meadville Church of Christ, officiating. Patricia will be laid to rest with her son in Greendale Cemetery, West Mead Twp. Memorial contributions may be made to Master Gardener Program, 1099 Morgan Village Road-Suite A, or to North Meadville Church of Christ, 16217 US Highway 19, both in Meadville, PA 16335. To send flowers or a remembrance gift to the family of Patricia J. Palmiero, please visit our Tribute Store. "Email Address" would like to share the life celebration of Patricia J. Palmiero. Click on the "link" to go to share a favorite memory or leave a condolence message for the family.